There is a growing realization that that streaming revenue is not growing quickly enough to offset the impact of declining download sales. It is an eerily familiar echo of the recurring narrative of the noughties that download sales were not growing quickly enough to offset the impact of declining CD sales. The situation is very different now in that the industry licenses the disruptive force. Back in the noughties the combined impact of changing consumer behavior patterns, growing piracy adoption and the loss of content scarcity were factors the industry had little control over. Yet this present shift is more fundamental and will have much bigger long term impact. This is the shift to the consumption era. Streaming happens to be the tool of the moment for harnessing that shift but with current pricing strategy the industry’s toolset is woefully unable to fully harness the massive potential that exists. The single biggest issue is the binary nature of streaming pricing: 9.99 or free. (Sure there are desktop versions for less but the desktop is yesterday’s consumption platform and is no longer a useful differentiator for price.) The leap from zero to 9.99 is simply too big. Even a 30 day trial still leaves the consumer with the same zero to 9.99 leap at the end. So streaming is bringing down the spending of the super fans and missing the spending of the mainstream fans. Most music fans (i.e. not the super fan aficionados who by definition most of the people reading this blog are) engage with music in a very event driven manner. They have their favourite artists and they engage with them when they are in cycle with a new single, album, tour etc. That used to mean buying an album or some tracks, and it still means buying concert tickets. But these days for the digitally engaged mainstream fans it most often does not include buying anything. Instead they stream for free from YouTube, Soundcloud, Pandora. Just to make things worse, the super fan aficionados are now spending less because of streaming. 23% of them used to buy more than an album a month, now they spend 9.99 a month and that spending is spread across a far greater quantity of music, meaning a smaller pie is being divided into even smaller slices. It wasn’t meant to be this way. A high tide was meant to rise all boats. Mass market music fans were meant to increase their spending to 9.99. The aspiration is reasonable enough, these same consumers have been persuaded to pay for mobile phone subscriptions over the last decade, and many have adopted Netflix and Amazon Prime too. But it will take some time to get them there and they need a helping hand in the meantime. Reduce the main $9.99 price point to $7.99: to capture the upper band of mainstream fans, while adding a $12.99 tier for super fan aficionados who want extras like high quality audio, bios, photos, exclusives etc. Universal’s Lucian Grainge stated at the WSJD conference this week that revenue from subscription services is simply not enough to stem the decline of downloads and CDs. As things stand he is absolutely right. But fill the chasm between free and paid with a diverse range of pricing options and that will change. Virtually every consumer market, whether it is phones, supermarkets or cars has a segmented pricing strategy, now it is time for streaming to benefit from the same approach. The alternative is leaving most of the potential spend on the table. This entry was posted in Ad Supported, Streaming, Subscriptions and tagged Ad Supported, Amazon Prime, Music Subscriptions, Netflix, Pandora, PAYG, Pricing, Pricing Strategy, Soundcloud, Spotify, Streaming Music, Subscriptions, YouTube by Mark Mulligan. Bookmark the permalink. As usual Mark I think you’re dead-on. The issue is still on the cost of music to the provider side. When the largest cost of service (content) is 65% to 70% of the retail rate – regardless of the retail price, that’s more than troubling. So your solution, in a nutshell, is to reduce prices for subscription services, without limiting the use of the ‘free’ options. What could possibly go wrong? Provision of pricing options in between ‘free’ and the current premium rates could be useful, but only in conjunction with restrictions on ‘free’ usage. Spotify claim their intention is to ‘drive users to our premium subscription tier’ but I can’t think of anything they actually do to achieve this. And then the elephant in the room is the continued existence of free pirate alternatives like Grooveshark and YouTube. A tad harsh to lump them together, but only a tad. (Try searching YT for any major pop title plus ‘full album’.) It would be easier to take seriously the claims of Spotify et al to be the saviours of the music industry if they would speak out vigorously against piracy. On the face of it this would be in their own commercial interests, but their failure to do so only confirms the suspicion that the continued existence of piracy is an important part of their business model, since it gives them the leverage they need to ‘persuade’ rights holders to do deals with them. I spend $150 or more per month on CDs. That must make me a Super Duper Fan! Seriously, music has been almost completely devalued, and the music industry is to blame. It’s really sad that access to the vast majority of the world’s music for a month is something that costs as much as a sandwich. But the toothpaste is out of the tube and there’s nowhere for prices to go but down as to increase the adoption rate. As ever, Mark speaks such obvious common sense about market segmentation and the need to tailor a range of streaming offerings to meet the needs of every type of music consumer. This was the first time I read an explanation about the issues with streaming music that makes sense. I’m spending much more than $10/month for music and would be ready to pay more for a streaming subscription. Still, it won’t be ever enough without buying the music you really love directly, on CD or vinyl. Also keep in mind that prices should be adjusted to the purchase power of the economy in each country, otherwise that creates an eficiency like in Spain where 3 years ago Spotify reached its peak of more or less 300K subscribers and has remained flat since. This means this is the amount of people that is willing and can pay this amount of money for a Spotify subscription. If Spotify has around 1 million subscribers in Sweden, a country with 8 million inhabitants, Spotify needs to find the price where they can get the equivalent penetration in the market, and this will only happen with the right price according to the purchase power. In Spain it should be 3€, 2,99€. In this time, where anybody can make a perfect copy of our music, asking “free” to go away is as easy as asking musicians to not give away their music. Because that’s what it comes down to, right? we are hoping the market will correct a problem that can be corrected by musicians themselves. Withhold free music, or only offer up a tiny portion for digital recording, and only provide the rest live. Even then it’s risky, because folks can capture sound from huge distances, but the truth is when musicians reduce the available pool of free music by removing it from market, the consumers will be more inclined to purchase the music they want. Why won’t this happen? because there are too many benefits – perceived by our ego, our dreams and our pockets – to getting our music out there “at any cost.” When we hear labels or clubs are only interested in how many friends and fans we have on facebook, it is an incentive to put music out there, get likes, and get those fans so you can get the gigs. When your friends ask you why you aren’t on spotify or pandora, the only thing to do is see if you can get your music where your friends and fans want it. If you want to market yourself, you had better have a website with a link to your music, and you also had better be on youtube. How else can you prove that you do what you do well? But once it’s out there… once that song is digital, it’s out there for good. What’s my point. Mark makes a great statement, that there are things that streaming organizations can do to help raise the monetary value of streaming music. I want to know – what would car companies do if people could suddenly build their own perfect copy of a car? What would their response be? It’s not impossible now that we have 3D printers. If we can figure out what other industries would do – or have done – once people could make perfect copies of their products – we can take steps to head in that direction… or NOT head in that direction as thecase may be. If it’s not too late. Keep going Mark, we need solid ideas like yours that we can take action on right away, not verbose statements like mine. Thanks for reading tho. As a label owner all I can do is shake my head at what is happening in the industry right now. I thought of these very ideas eons ago, before streaming was even much of a thing. I’m sure it’s crossed everybody who is in a real position of powers mind long ago too… Yet no action. It’s ludicrous. I imagine Spotify, and all of their competitors, realize the first well funded company to implement such a model would KILL IT. I’m sure if anything it is the major labels holding this back… For what reason I can’t even conceive. How could they complain about higher effective rates per stream with lower tiers? That should be the ONLY requirement on lower tiers is a higher per stream rate. In the time I have thought on the subject, I think the below is the best specific implementation I have come up with thus far. But there’s room to play with it… There has to be! Set number of streams for a certain amount of cash. Simple. An amount GREATER than the current average Spotify et al pays on their all you can eat plans. By my royalty statements, a penny a play would work fine. It DOES kind of set a maximum rate, but it’s higher than things are now anyway, and can always be adjusted in the future… Which is the point! Continue free ad supported, but perhaps with more limitations on how many songs, or perhaps more ads… Assuming they can sell more ads. Specifics need to be played with. I have no problem with free if it can generate sustainable income per stream. $2.99 a month plan for 250 plays. This seems really small, but it’s over 16 hours of listening a month with 4 minute songs. I think a lot of users would clock in at this or less… And I bet a lot of low value customers would pay less than a latte if it gave them all the ad free listening they could ever want! THEN, to maximize these mid tier customers, offer users an option to allow a plan over run “a la carte” price after 500 plays where it simply continues to charge a penny a play. Or maybe 2 cents as an incentive to encourage them to spring for unlimited. At 1000 plays (or 750 if .02 a play) it converts to a $9.99 a month all you can eat plan for the remainder of that month, reverting to the $4.99 plan next month. Or maybe you let it keep charging them, which provides additional incentive to just go for unlimited, including the months they wouldn’t have reached the previous lower limit! A user can opt out of the above, and instead get kicked back to ad laden listening if they want to “cap” their spend at $4.99 or whatever. The above MAY encourage mid tier people to over run their plans, which would be a nice outcome to begin with. Or it may encourage them to simply spring for all you can eat if they find they go over anyway constantly, thus “slowly” converting a mid tier customer to a higher value customer. There’s room to play with things. Keep in mind this will still all be pooled. So users who spring $4.99, and only play 368 songs in a given month will be increasing the effective rate per stream. In my experience with eMusic (which is essentially the above but for downloads) there has NEVER been a single quarter where we received the theoretical minimum payment. There are always users who don’t use their full allotment. So effective rates will be higher than the .01 cent by some percentage. Incidentally with eMusic this rate is usually 10-15%. $14.99 (or something higher than $9.99) for Hi-Fi as you mention. To me there is no downside for anyone to try the above. It’s better for streaming companies, it’s better for labels, it’s better for artists. It may finally bring the mass market into streaming. It still ties quantity of consumption to spending varying amounts of money, which to me fundamentally needs to be somewhere in the equation. Once people are accustomed to the above in general principle, it also allows the market to play with specifics. What if the data says the medium-high value customers who want unlimited are willing to spend $15 a month? Well make $9.99 a month 1000 plays of course, and start charging $15 to those high value people! Ultra high value audiophiles will pay $20 a month? Charge them that then! Variations on the above are endless, but without trying a basic plan like the above first we’ll never get the data to find the “proper” price points that the market NEEDS to find to survive. Maybe a service could offer “half the ads” on 1000 plays also for $4.99 a month. Maybe you don’t get converted automatically to all you can eat for the month if you go over, but end up with a bill for $11.42, which is more than Unlimited would have cost you. Maybe there’s NO minimum at all. You simply pay 1.5 or 2 cents a play and pay whatever the tally is at the end of the month. There are many ways to play with the general ideas, but it blows my mind there has been NO variation at all tried as yet by a real player. Maybe somebody needs to just cut a deal with a major content aggregator or two and any indie label that will sign on and get to work on this. Once it went big the majors would be lining up to sign on. The thing that has me more terrified than anything is the rumor that Apple wants to go to $5.00 a month for some kind of subscription with Beats when they’re done with reworking it. If it’s unlimited this will kill the industry for good. There just aren’t enough people to make the math work. If 1/3 of the US populace ALL signed up, it’s still a 6 billion dollar a year US business. I don’t think we’d ever hit 1/3 penetration, hence we’d be dead. Apple and their decreeing limited, specific, pricing for downloads led to this “one size fits all” kind of thinking in the first place. I still don’t know why you can’t sell a .19 cent download on iTunes. Price matters, and for some new acts they might be willing to try to make it up in volume for the new fan base who would have tried them out at a lower price point. But Apple knew better than the content owners apparently. They expanded and allowed more options after years of .99 cent and only a few album tiers, but I fear this type of thinking still dominates. I say we stop trying to sell people recordings as a way to support the music industry. It just doesn’t make sense as the focus of an artist, or a listener. It only makes sense for labels, who artificially inserted themselves into the recording process because it used to be so damn expensive to make a recording and distribute it worldwide. Now pretty much anyone with a laptop has what would have been, 25 years ago, an unparalleled reach and incredibly cheap distribution costs – it only costs the bandwidth of the initial stream. I understand that the current music industry has developed a culture and identity around selling recordings. In fact, majority of non-artists employed in the industry will probably not be justifiable to employ in 10 years. Every aspect of music, from discovery to production to promotion, has had its cost and complexity reduced by orders of magnitude, because of modern computers and the internet. Instead of paying for the massively inflated egos of record execs, marketing budgets, and armies of copyright lawyers, artists might be able to find a small committed base who will see them live, or buy the vinyl deluxe record and a t-shirt for Christmas. This isn’t going to make hardly anyone rich, but I suspect the average non-chart-topping artist will actually have a better time financially and creatively. I won’t mourn the homogeny-inducing Top 40, the platinum-album dinosaurs that we’re seeing disappear. I’m going to relish the renaissance of music driven by desire to make music, not money. Re: WagonWheel, I have spotify on almost constantly, every day. I go through huge swaths of music, discovering things I never could have found on even a $100/mo budget. If a label decided their business model was to make me pay more for their music because I wanted to listen to it more, I would either boycott them or actively pirate them to all my friends out of sheer spite. But that’s just me. Beats is likely to go $4.99/mo, and that will kill most of the independent streaming companies. There are too many streamers; and once the price drops, you will see consolidation. This is how markets evolve – yet every time, the players do not see it. Each one believes they have some unique, privileged position – yet they all have the same product (the same music), and soon all will have relatively the same Curation. So what differentiates different streaming companies? In most cases… very little. The best ones will innovate, will foster much better relationships with the artists, and will come up with something new and innovative – perhaps like being an Indie label that returns more money to artists. When the consolidation happens, don’t think it is a big surprise. They all have an opportunity, right now, to truly innovate – but most are not. As someone who works on the label side, I agree and disagree with many points. Believe you me I’m not a fat cat being driven around in my Rolls Royce, and frankly I don’t care to be. One thing that many people get incorrect about the modern music business is that there is no place for labels. I hear it all the time. This just isn’t correct. A DIFFERENT place perhaps, but not no place. The short version is, many artists don’t want to, or simply aren’t suited to handling a lot of aspects of what it takes to get ANYWHERE, let alone be able to make a living, LET ALONE be a widely heard and “successful” artist. In a perfect world, with the tools at hand on the internet, many/most artists COULD in theory do without a label. But that’s just not the real world. That’s the same argument as saying “Well why are there homeless people in America? It’s so easy to get a roof over your head and food in your belly in this country. Heck, why isn’t everyone in America a millionaire? The opportunity is there for anybody.” The fact is in an abstract, non real world sense, it’s damn near true. Anybody could be highly successful, and certainly everybody should be able to put a roof over their heads. But that’s ignoring the “people” part of the equation. In my personal experience many of the most talented musicians I’ve ever known were HORRIBLE business people. No business sense at all. Hell, many of them didn’t even have much common sense in just general life stuff, let alone running a successful business enterprise… Which is what a band is. Even a popular local band has a LOT of business going on. Managers, booking agents, graphic artists, press/promo people. And that’s at a small scale. Those all COULD be band members, but they’re usually not. Because if the guys in the band tried to handle everything, even when they weren’t well suited to it, it would fail. Do you think anyone would know who Jimi Hendrix was if he didn’t have business people helping him? He was so high out of his mind all the time he didn’t know what was going on. They literally had people follow and/or track down Jim Morrison all the time because he would get so messed up he’d forget he had a show to play… In front of tens of thousands of people. Maybe being high all the time made their music better, I dunno… But they wouldn’t have ever got out of a 100 or 200 room venue without people helping them. And playing 100-200 room venues is barely enough for someone to make a low rent living, let alone live a decent life. So they would have wallowed in poverty, best case scenario, without help. Instead they added to musical history in amazing ways. You say you don’t care about platinum artists. Neither do I. The last new bands I liked that sold millions of records pretty much all came out in the 90s. But you’re naive if you think huge bands are ever going to go away. And as long as they stay there will be a large amount of business to attend to. And many artists won’t be able to handle it. Now, another thing is, sometimes when people CAN do a lot of things because they “have it in them,” they don’t want to! I’ve known a lot of smart, on point musicians like this too. Not every musician is a drugged out lunatic obviously! Still, they don’t want to deal with paperwork. Bookings? Nope. Some of them don’t even want to learn much about recording techniques, mixing, mastering… And those directly relate to the end artistic expression! So many people CHOOSE to sub out these things because they detract from them focusing on the music, or they’re simple unpleasant for them. And what it really comes down to is the thing that made the modern world exist as it does today: Division of labor. I don’t have to own a cow to have a glass of milk. I don’t need to learn how to fix my car if the engine explodes, although I can change the oil if I feel like it. I usually don’t. This division of labor makes things more efficient because everyone is a specialist. As I said I’m not saying the role of a label is going to stay the same… It’s not. However they’re not going away. The knowledge labels bring is an area that will never go away. Bringing in the right producer for a project, knowing the best session Hammond B3 player in town, marketing contacts. Those things don’t magically just fall into a musicians lap one day when they decide they’re going to try to make a go of things. In the real world professionals will always exist. I wouldn’t mourn the loss of the sleazy record business guys out there, but I’m not one of them. More people who try to bring legitimate value to the project are needed, not NO business minded people. As to your whole thing about Spotify… I’m glad you use it. I have no problem with you. But I do think it’s kind of fair for musicians to make a living. And myself for that matter. I’m not saying to jack the price to 100 bucks a month for someone who listens constantly. That would be absurd. You play music all the time, great. Some people don’t. So to play with models to encourage less enthusiastic people to pay SOMETHING is a good thing. I think the 9.99 price point on unlimited is somewhere in the ballpark of the “right price.” However if it makes more money for musicians overall by charging 12.99 then I think that’s a good thing. Everyone has the right to charge what they can for their effort. Whatever job you do I’m sure you wouldn’t want people to decide your time is only worth half as much an hour… Or maybe nothing! Why don’t you just work for me for free! Being a GOOD musician is a valuable type of labor to me personally, and I think it’s only fair those people make a decent living off of it. It sounds like you don’t. You want to live in a Utopian world where you get the things you want for free, while you of course get paid for what YOU do. Why is it reasonable to pay for a latte or a sandwich, but you think music should be free? At least as far as recorded music it sounds like. Doesn’t make sense to me. Kevin Sinclair: I agree the big boys will probably end up dominating. Even if Spotify were the one to take over streaming, as it takes over the music business, some big company would just come along and buy them out. They won’t stay stand alone unless they themselves turned into an acquisition hungry conglomerate. Seems like those are the only kind of companies we’re allowed to have anymore! I really do hope the tailoring to every type of music customer doesn’t go too far. It all gets very complex, the mobile phone market in the UK being a good example, where people often end-up on a tariff that isn’t right for them and it takes a person-to-person phone call with a company to sort out. PAYG/Topup might be good for the phone industry but every consumer I know hates it, amnd surveys by consumer groups report the same. God forbid even half of Wagonwheel’s “plan” ever gets implemented. And all this talk of various price points and methods of buying skips nicely past a valid point in Albert’s post above – geographical differences. In the UK we pay 9.99 UKP, that’s $15.79. In Spain they pay 9.99 Euros, in common with the rest of the EU. But in Spain, average pay is more than 25% lower than the UK, but then it’s not about earnings is it, because cost of living is different, so let’s make it about disposable income. Well, that’s almost the answer, but then there are the other factors, you see, it costs money to consume the music. In Spain, where Albert lives, broadband is about twice the cost that it is in the UK, and that’s in the home, it’s more on mobiles. Obsessing over $ price points in an industry with global reach seems like a waste of time. It’s easy to see what the companies are doing, they’re trying straightforward pricing approaches to pull people away from the download and free models. And Rome wasn’t built in a day…. The Spotify man is right, the 120$ (oh sorry, the $189) they get from me is more than I used to spend on music in a year. It’s also more than my daughter used to spend before she subscribed, and my son too. My daughter because she didn’t have the money, my son because he knew of other ways of acquiring music. As Spotify has been in the news this week, i’ll refer to that story. This industry was said to be broken long before Swift started doing what she does, and it’s in that climate that she’s managed to earn more than a couple of hundred million dollars. The industry is clearly still making money long after the exaggerated reports of its death. Any artist can walk away from streaming if they want to, but in my view the streaming services are part of the solution, not the problem. And the last thing they should do is alienate customers with crazily complex pricing strategies. What you mention about the UK paying more is exactly WHY there needs to be more price points, and variations in models. Name to me one single product category where there’s no variation in terms of the pricing, and quality of the service??? There isn’t one! There’s always been nice, expensive cars… And basic, cheap cars. Nice expensive shoes and cheap basic shoes. The same was in fact true for many albums in the physical era. Regular album, deluxe version with extra liners etc. Or more apt for music, the life cycle. A new release would be “full price” (sometimes heavily discounted anyway) when it was new, and cheaper once it was a catalog album. Imagine if we simply “cost averaged” new cars and said everyone could drive whatever they wanted on rental so long as they made a car payment of $350 a month, which would then be divided amongst all the car companies on a pro rated basis… It’s obviously silly within that context, but that’s what is being done with music. NetFlix, despite being minorly annoying from a consumer perspective, is a model for windowing releases. Maximize when something is new by restricting the ways to get it, and get whatever you can from wherever you can once it’s not. Not my favorite method, but it is a way. I think the “pay for use” model of streaming makes more sense. Lower tiers for less enthusiastic listeners is obvious. You may be spending more on streaming now than you were in the CD era, but a lot of people aren’t. I don’t think unlimited needs to be total nosebleed pricing, but I don’t think it should be much (if any) lower than the 10ish USD mark. Back to the international pricing, to me it seems obvious that one should price things (including music) more affordably in a less affluent country. Why? Because in any market there is a “maximum revenue” point. That’s where you want to be as a seller. If you can sell one unit at a million dollars, or one million units at 10 dollars… Obviously selling them at 10 is the way to go. But selling 5 million units at one dollar puts you lower than selling a million units. So why bother? This is how everything else is sold too. You don’t pay as much for a Coke or whatever in Brazil as you do in the UK or US, because they simply can’t afford it. 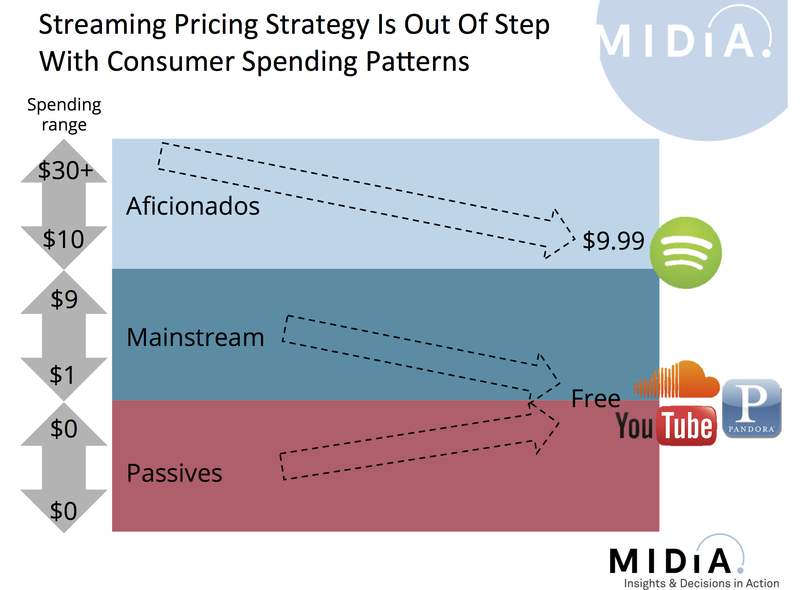 So why shouldn’t music pricing be variable? Pricing the UK differently than the US, and differently than Spain, and differently again in India is only reasonable. Maybe the UK should be about 6 Pounds, the US 9.99, Spain 7 Euros, and India 250 Rupees a month (about 4 USD). Who knows what the “right” numbers really are… The point is trying to apply a single broad pricing for any product is stupid, and I literally can’t think of a SINGLE product category where it is done like that. Period. Morons are trying to do it with music now, but it won’t last. Streamers such as Spotify and their ilk are selling convenience not music. The mainstream and passives can buy or download their music from other sources. Users have the problem of getting their music conveniently when and where they want it. Solving that problem is a value added service. That is what Spotify and the streamers do. People who are paying $9.99 a month are not paying for music, they are paying for convenience. Convenience such as the music they want to listen to, in the order they want to listen to it, on all their devices, especially mobile devices while they are on the go. Convenience such as curation and introduction to new artists and sounds and the ability to conveniently share their discoveries with friends. Those people not paying $9.99 already have free alternatives that are not as convenient (not mobile, has ads, no control of mix, sound quality etc.) $0 to $10 is a big step. Its either all convenience or no convenience. Its a Bus or a Limo. Some users need a taxi cab. It should be priced at $5.00 a month for some convenience and then measured to see how many new users are attracted to it. That would give some idea of the elasticity of demand. It will change rapidly as the conveniences change and the market develops different tastes for them. I very much agree with the idea of tiered pricing for these services.